Guard dog breeds are bred to have a natural drive to protect. Let’s learn the backgrounds of some guard dog breeds, as well as the proper ways to train, socialize and parent a pup from one of these guard dog breeds. 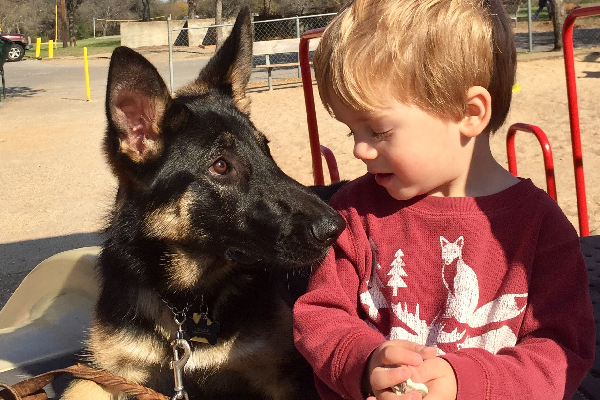 German Shepherd Dogs are natural guard dogs, but, like any guard dogs, you can train them to graciously meet and welcome newcomers of all ages. Photography courtesy Lynn M. Hayner. I’ve always had German Shepherd Dogs (GSDs), a breed with the natural drive to guard and protect. Anja, my current puppy, is only 6 months old, but when she’s full grown I expect her to watch my back. I also, however, expect her to graciously meet friends, calmly meet children when I give seminars and treat newcomers with composure. I’m often asked if I’m training my dogs to be suspicious. Far from it! First of all, Anja’s drive to protect is characteristic of a well-bred GSD. And by well-bred, I mean a dog from professional, conscientious breeders who develop their lines for temperament as well as health. Secondly, quite the opposite of encouraging suspicion, I expose Anja to many people and situations to nurture her discernment. An abundance of exposure to positive situations and people will help her distinguish good from bad in the future. To understand socializing any protective or typically guard dog breeds, consider this analogy: Suppose you’ve never had apple pie, but over time someone brings you a delicious (but differing recipe) piece of apple pie daily. Eventually, someone brings you a sub-par piece of apple pie, the quality of which you’re only able to discern because of all the prior experience. Similarly, while later on Anja will know good from bad, she doesn’t as a puppy. The more exposure I give her, the more clarity and strength of conviction she will have (concerning any real threat) as an adult. While it’s awesome to own a devoted, protective or typically guard dog breed, it’s also an enormous responsibility. 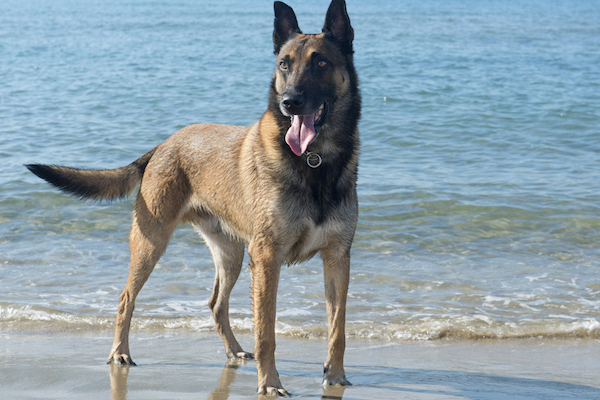 The Belgian Malinois is among the most elite of guard dogs. Photography by cynoclub / Shutterstock. I consider myself among the elite working breeds — no wonder I’m chosen to assist the elite U.S. Navy SEALs. The military counts on us for their toughest missions. I’m famous for my keen intelligence and outstanding athleticism. My forefathers were developed in the city of Malines in Belgium as tough field and farm dogs. We were bred with the temperament and strength to guard, not simply herd, livestock. Now keep in mind that some breeds, such as the Border Collie, herd but don’t necessarily protect. And other breeds, such as the livestock guardians (for example, the Great Pyrenees) protect but don’t herd. I was developed for both. Today, my protective disposition means I’m game to take care of my family and home. Families interested in sharing their lives with us should look to professional breeders who emphasize good nerves, confidence and stability in their dogs. 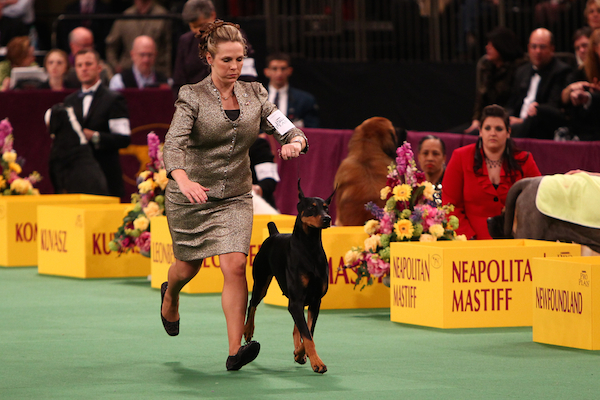 Doberman Pinscher Grand Champion Protocal’s Veni Vidi Vici at the 2012 Westminster Dog Show. Photography by Debby Wong / Shutterstock. We were developed by Friedrich Louis Dobermann, a German tax collector hassled by robbers one time too many. Dobermann developed us for a twofold purpose: protection and companionship. Recognizing my forefathers’ working abilities and loyalty, Europeans soon employed us in military and police work. We also served in WWII as sentries and messengers for the U.S Marine Corps in the Pacific. A statue, “Always Faithful,” in Guam memorializes Dobes that served our country. Today, we’re excellent guard dogs, alerting our families to new happenings and standing between our loved ones and danger if needed. Now for a caveat: We’re a tad mushier with our family than stereotypes indicate. But after all, it is my loyalty and love with family that motivates my protection drive. I care for those I cherish. 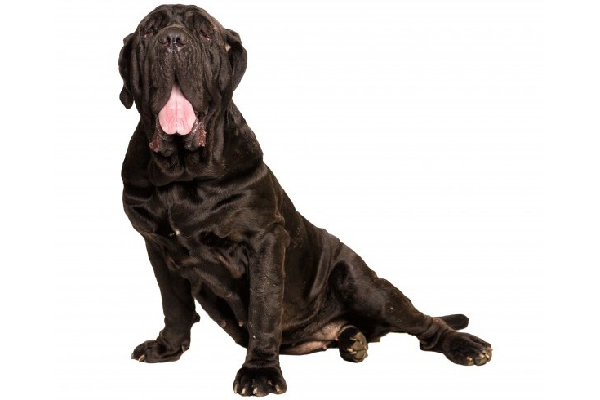 Cane Corsos come from early warrior dogs. Photography ©ESOlex | iStock / Getty Images Plus. We descended from early warrior dogs, developing into a multipurpose guardian, hunter and outstanding Italian farm dog. Whether controlling cattle herds, hunting boars or guarding flocks of sheep, we served our family with unwavering dedication. Today, we continue to take our security role seriously. We’re self-assured and rather aloof (but not overly reactive) with strangers, but wholly devoted to family. All of that sounds perfect, right? Well, don’t underestimate the work it takes to own a breed like me. To help me realize my potential, I’ll need ongoing socialization and obedience training. Fortunately, we like to work. Do you? 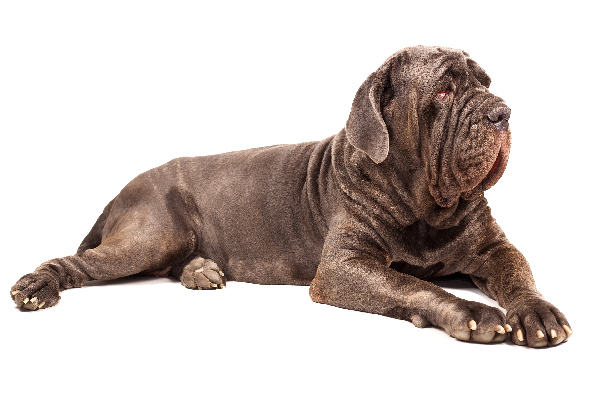 Neapolitan Mastiffs are guard dogs with an alarming (or, we think adorable!) appearance to ward off trespassers. Photography by Shutterstock. Enormous and magnificently powerful, I’m recognized by my wrinkles and huge head. I have both an impressive size and imposing attitude. In reality, I was bred for an arguably alarming ugliness to ward off trespassers. My forefather was the ancient Molossus, a dog with the courage to take on lions and tigers. My family tree also includes Roman war dogs. In Italy, we were bred for estate and home guarding. One of my nicknames was the big dog of the little man. These days, I continue to take my guard dog duties seriously. I’m steady, loyal and vigilant, but relatively silent while on duty. German Shepherd Dogs are natural guard dogs that excel in police and service work, search and rescue, and therapy. Photography by jody/shutterstock. Planning to breed specifically for intelligence and utility, Captain Max von Stephanitz began developing us from sheepdogs in late 19th-century Germany. Strong, smart and motivated for hard work, we guarded, protected and carried messages in the wars. We also excel in police work, service (such as guiding the sight impaired), search and rescue, and therapy work. Today, we continue in all of these working roles, but we take our family watch-dog role seriously. Born with a feeling of responsibility and extraordinary intelligence, we’ll need extensive training to learn how to manage our drives and abilities in the human world. With the right training, I’ll make you proud as a friend and defender. 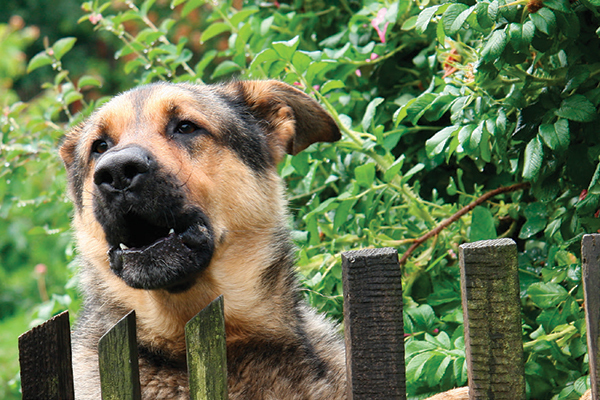 Tell us: Do you have any guard dog breeds? Thumbnail: Photography by smikeymikey1 / Shutterstock. The post The 5 Best Guard Dog Breeds appeared first on Dogster.